With Sixt car hire Bordeaux exploring this famous city is made easy. Our wide range of vehicles and rental extras ensure we are able to satisfy every group size and budget. Make sure to check out our special offers for our best current deals. Our Bordeaux vehicle fleet encompasses economy options, luxury models, and even minibuses for larger groups. If you are travelling with a lot of luggage perhaps you would like to opt for an estate car or 4x4 hire. You can always make the most of the stunning south of France weather with a convertible or a head-turning sports car. At Sixt we pride ourselves on the quality of our service and ensure that we can offer the best vehicles for our customers, and that is why we hold close partnerships with premium manufacturers such as Mercedes-Benz, BMW, Jaguar and Audi. Available Extras: In order to maximise the comfort and convenience of your Bordeaux car rental, we offer a variety of extras that you can add to your booking. These include baby and booster seats, Sat Nav devices, and comprehensive insurance options, including for under 25s. Driving in France: Its important to know the rules of the road before getting in your car, so be sure to take the time to review our quick and easy guide to driving in France. Payment Options:There are various ways in which you can make payments for Sixt services. For further information take a full look at our payment methods to see which debit and credit cards are accepted. The city's artwork includes works by Francisco Goya and Edouard Manet. The city is also home to world renowned museums, including the Musee des Beaux Arts and Musee d'Aquitaine. Branch out further and explore Bordeaux's rich cultural landscape and drive along the 19th century bridges that traverse the Garonne. This city is also home to many historic churches, including St. Pierre and the Church of the Holy Cross. Rent a car in Bordeaux to take yourself out to the towns, chateaus and vineyards that surround the city and region - that would otherwise be unreachable! Travelling to Bordeaux for the Euro Cup 2016 and need insider tips for tourism, what to eat, how to drive and, most importantly, enjoying the football? 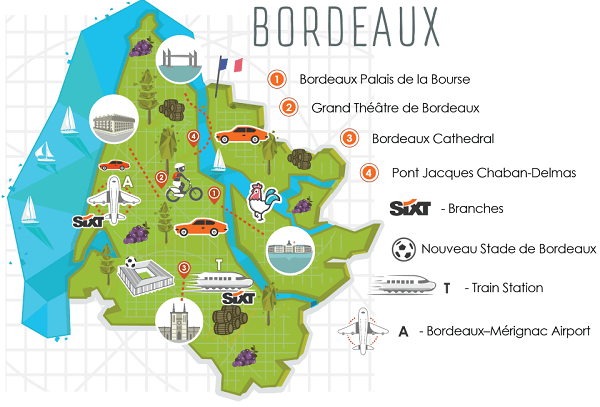 Check out our useful Euros 2016 Bordeaux Guide!